What's Going On With Gold And Silver? I've been getting a lot of emails from people who are relatively new to the precious metals market asking me what is going on in the gold/silver markets. It would seem logical that the precious metals should be moving a lot higher after the FOMC announced its latest QE program. How is it possible that the market is dumping like this, in conjunction with a concomitant decline in the dollar? I thought I would quickly explain from a technical perspective what is happening. 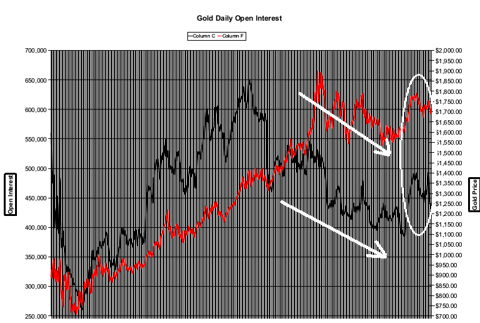 Whether or not you want to believe that the Comex metals markets are manipulated, there is no question that there is a high correlation between sharp market moves in gold and silver and moves in the open interest of Comex gold/silver futures. This has been a pattern that has persisted and repeated for at least the 12 years I've been tracking this market. The cycle goes something like this: 1) As the metals move higher, the large hedge funds increase the size of their long position. This tends to accelerate as the market momentum to the upside increases. At the same time - being that futures are zero-sum market (i.e. for every buyer there's a corresponding seller) - the commercial segment (largely the so-called bullion banks who make active markets in gold/silver futures, among other bullion market functions) - increases its concentrated short position by a like amount. I get the weekly open interest segment breakdown from the weekly Commitment of Traders (COT) report. The easiest version to read of the "disaggregated" COT report read can be found here every Friday after 3:00 p.m. EST here: The Got Gold Report. As you can see, the price of silver has held steady throughout the overnight trading (attributable to the strong physical buying going on right in India and Asia). But right as the gold floor is opening on the Comex, silver falls right off a cliff. If you run these charts over time, you'll see that it's serially repetitive and in conjunction with the liquidation of COT open interest. Call it manipulation or call it what you want, but it's a real-time event. Eventually the large spec funds "sell out" of a large portion of their long positon, the commercials cover their shorts and the cycle repeats. Although the open interest in silver has only dropped about 10k contracts from its recent peak, the open interest in gold has dropped substantially from its peak of 492,000 in early October to yesterday's 437.6k LINK. If you look at the last couple of disaggregated COT reports in the Got Gold link above, you'll see that the large spec segment ("managed funds") has significantly reduced its long position and the commercial segment has significantly reduced its short interest. This chart goes from Jan 2008 to last Friday's COT report. The red line is the price of gold (right axis) and the black line is the net short interest (left axis) of the commercial segment on the Comex. 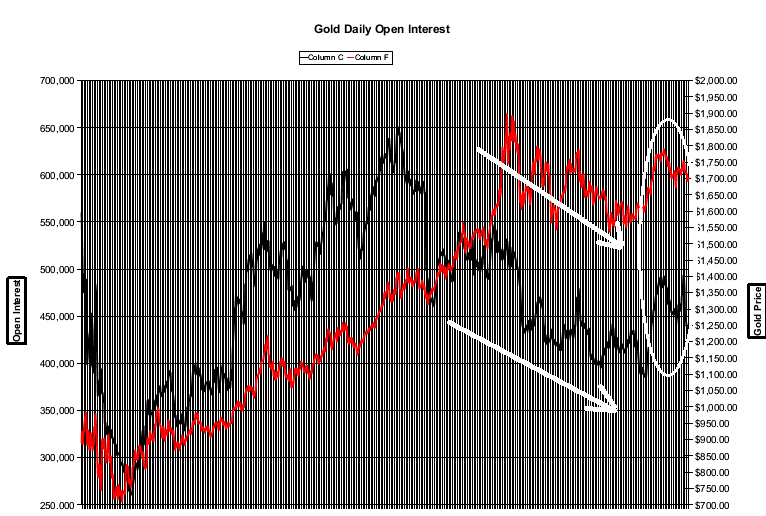 The white arrows show the recent correlation in movement between the gold open interest on the Comex and the price of gold. You don't need to be a regression expert to see that the correlation is pretty close to 1. My point here is that the current sharp sell-off in gold/silver is being accompanied by what I call a Comex open interest stop-loss liquidation. 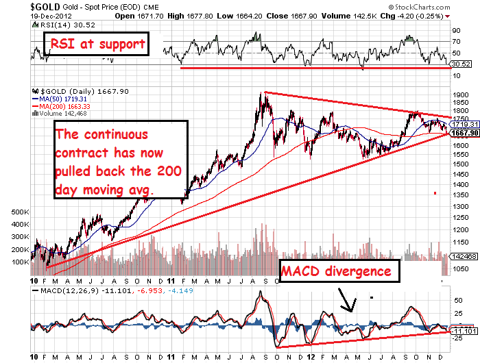 This has been a wash/rinse/repeat occurrence for many years during this precious metals bull market. This isn't the first one and it won't be the last. But, in my view we getting near the end of this particular Comex paper raid. I suspect that at some point in the next 3-6 months that gold and silver will be started on their way to new all-time highs.